Extension to Kalamaria – ΑΤΤΙΚΟ ΜΕΤΡΟ Α.Ε. Thessaloniki Metro line is currently being extended towards the areas of Nomarchia, Kalamaria, Aretsou, Nea Krini and Micra. This underground extension shall be 4.78km long with 5 new Stations. 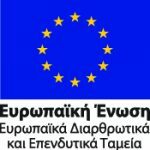 More precisely, the project concerning the first extension of Thessaloniki Metro to Kalamaria was tendered on May 6th, 2009 and the relevant contract was concluded on June 2013 with AKTOR ATE Joint Venture. The total budget of the project amounted to 518 million (400 million € concern the contract in question). This project has been integrated in the National Strategic Framework – “Macedonia – Thrace” Business Plan and is funded by the European Investment Bank. In June 2014, construction works have commenced at NEA KRINI Station, which is included in the Thessaloniki Metro extension to Kalamaria, and constitutes the second Metro worksite after the TBM startup shaft. Moreover, the infrastructure for the future extension of the Metro Line to the Airport is foreseen to be constructed together with a well-organized Bus Transfer Station in the area of Micra Station. A car parking facility is also planned to be constructed in the same Station. This extension shall service more than 65,000 passengers, proportionally reducing the number of trips by private vehicles. It shall only take 15 minutes to cover the distance from Micra Station to the center of Thessaloniki. This project shall upgrade the municipality of Kalamaria in terms of transportation and environment, improving at the same time citizens’ every-day life. 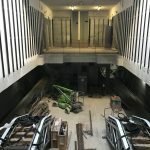 NOMARCHIA Station: Architectural works and works for the installation of E/M systems are in progress. KALAMARIA Station: The works for the construction of the east access, as well as the architectural and E/M installation works are in progress. ARETSOU Station: Architectural and E/M installation works are in progress. NEA KRINI Station: Architectural and E/M installation works are in progress. 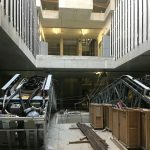 MIKRA Station (Station & Crossovers): Architectural works at the station, as well as works for the construction of the roof slab at the 1st Crossover are in progress. Forestation: Trackwork, architectural and E/M installation related works are in progress. NOMARCHIA Station: Floor cladding works using granite slabs are in progress, while E/M installation works are at an initial stage. KALAMARIA Station: Painting works are at an initial stage, while works for the construction of the platform and the construction of the north ventilation shaft have commenced. ARETSOU Station: Floor lining works using granite slabs are at an initial stage, while painting works and platform construction works are at a satisfactory level. NEA KRINI Station: Works for the construction of indoor walls lining and the construction of E/M installations advance at a satisfactory rate. MIKRA Station (Station & Crossovers): Slab construction works at level -1, at the 1st crossover, have been completed, while the works for the construction of the perimeter permanent lining, at the 1st crossover, are in progress. Moreover, the works for the excavation and temporary retaining of the NW access and the south ventilation shaft are at an initial stage. Forestation: The works for the construction of industrial floors and the installation of doors are at an initial stage. Moreover, works for the construction of trackwork are in progress. TBM tunnels: The construction of pumping stations related continue.